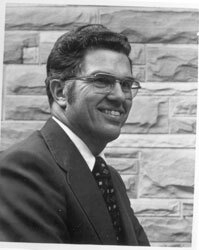 Brandt became the university’s 11th president in December 1974. Prior to his appointment, he spent four years as president at Virginia Commonwealth University. His background also included six years in administrative positions at Virginia Polytechnic Institute and State University (Virginia Tech) and he headed chemistry departments at both Kansas State and Purdue. During Brandt’s tenure, he tripled national funding for research and training in four years; oversaw physical improvements to the campus; and led a renewed emphasis on service to the region. He witnessed the opening of the Student Recreation Center, dedication of Faner Hall, and funding for the SIU School of Law Hiram H. Lesar Law Building. A native of Lansing, Mich., Brandt earned his Ph.D. in analytical chemistry from the University of Illinois Urbana-Champaign and his bachelor’s degree in chemistry from Michigan State University. Brandt left SIU Carbondale in 1979 to become vice president for general administration of the five-campus University of Maryland system.